Limitless Ltd are a “natural light solution company, providing light solutions across the UK”. 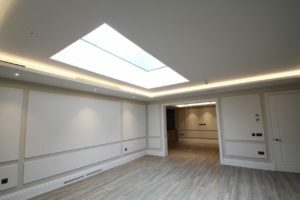 The products created by Limitless Ltd distribute enhanced daylight into ‘windowless’ areas of a building such as basements or extensions, whilst their Walk-On Glass Floors and Light Well Covers transfer natural light from one floor to another. There are many health benefits associated with exposure to natural lighting, which include increased productivity and enhanced concentration. As Limitless Ltd continues to grow, they identified a need to add more production capacity in addition to their existing sources of supply. After extensive research – Red Box Engineering proved the perfect fit to produce the metal work for Light Shafts in particular. Limitless initially sent out a trial order to quite a few different companies and Red Box Engineering came out on top based on cost, quality and the service that they provide. 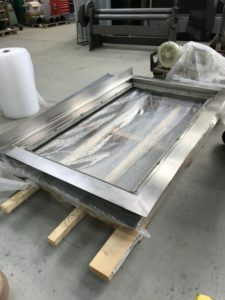 In a recent project, Red Box Engineering have been involved in the production of a specific Light Shaft made from 3mm stainless steel, this product was installed into a flat roof to draw natural light into the room below. The process began with the stainless steel parts being cut to size using our water jet. The team then TIG welded all the parts together after they had been folded on the break press. Once welded, all external welds were dressed and a dull polish was applied to create the satin grain finish that was desired. This smart, smooth finish is impressive and fits perfectly with the overall design of the building it was installed in. A huge congratulations to the team at Limitless Ltd who have recently won the South West regional award for ‘Business & Product Innovation’ at the FSB ‘Celebrating Small Business Awards 2018’. This competition was designed to find the best small businesses across the whole of the region and Red Box Engineering are proud to have been involved in such an achievement for this small business. The Red Box Engineering team are looking forward to working alongside Limitless Ltd on future projects and Limitless said “Due to the excellent work and finished results that Red Box consistently achieve for our products we are thrilled to partner with them on many future projects”.